Behind the seemingly ordinary life of a practicing architect lies a whole host of non-professional impulses that give shape to buildings. Stories of Storeys: Art, Architecture and the City is about these impulses and conditions—social, literate, personal and political—which are expressed, but often ignored in architecture. Bhatia looks at the ordinary, physical, visible and tactile involvement of our urban environment and the way it affects, communicates with, or influences us. An all-inclusive sociology of architecture, the book draws on the social life of some of architecture’s role players, people whose peculiar demands on design have come to characterize the building environment of our times, and times that are characterized by this progressive isolation of architecture from the society of common people. Growing up in a family of architects and engineers, the one thing I always wrote against the question 'What do you want to be when you grow up' was Architect. Well, life had other plans, they said Architecture needed science background and eventually my hatred for science won over my love for Architecture. So here I am today, an ex-banker turned editor/ book reviewer, having read a book on Art and Architecture, wanting to share my feelings on it. The career goals might have surely changed but my interest in architecture is still intact. I surprised myself when I read this book and connected so well that I am actually considering adding a degree in architecture to my wish list along with a Ph.D in Creative Writing. My love for buildings and houses still continues, while today I see it more as a writer and try to imagine the stories hidden within those walls. I see people coming to life, ones who had lived there before and how their lives looked so different then. Coming to the book, it is no surprise that this book is exceptionally well written and is backed with immense on-hand experience of the author. His expertise mixed with this artistic mindset lend a unique voice to this book, making it an extremely interesting read. 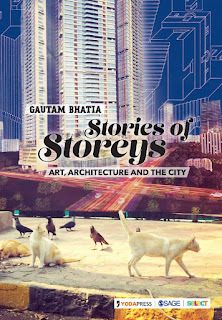 Gautam Bhatia graduated in Fine Arts and went on to get a Masters degree in Architecture. A Delhi-based architect, he has received several awards for his drawings and buildings and has also written extensively on architecture. 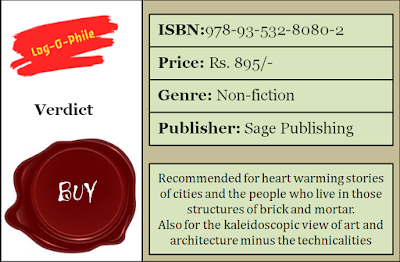 Besides a biography on Laurie Baker, he is the author of Punjabi Baroque, Silent Spaces and Malaria Dreams―a trilogy that focuses on the cultural and social aspects of buildings. Blueprint, a collective of his architectural works will be published in 2018. Bhatia is currently working on Future Building: Ideas for the Future City. I fell in love with the author's style of writing, part conversational and part informational, he has a way with words. There were a lot of places where I was left aghast at the surprise elements he has been able to weave across his narrative with such panache! I read this with a lot of interest, half expecting a story about how spaces are crucial in bigger cities but was stumped with that last line. 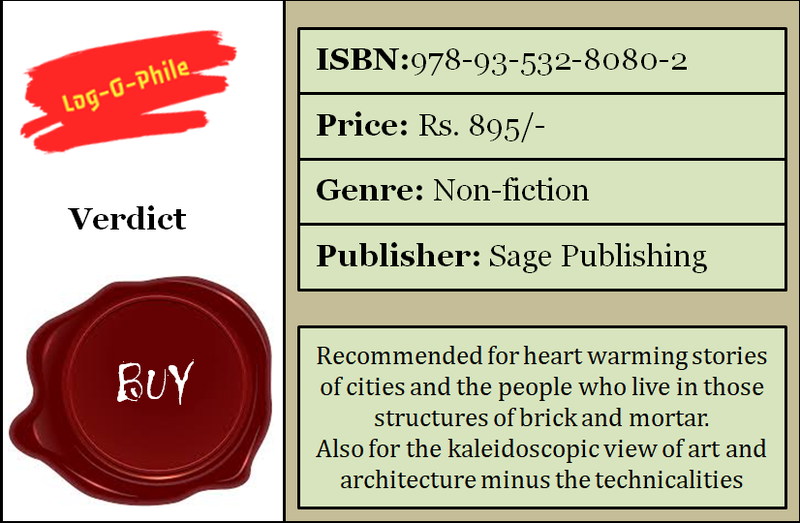 I cannot tell you what happens next but am sure this gives you a glimpse of how the book talks not only about the buildings and houses, but also the lives of the people who occupy them. How sometimes the more spacious the houses, the more empty their lives are. How the coffers are filled to the hilt but their souls keep depleting away with no respite. How they live in the city of dreams but their dreams have lost their meaning long ago. Neatly divided into twenty five chapters, the book has two parallel narratives going on at the same time. One is the text/ theory, which occupies the pages on the left side of the book while the other is such stories with black and white pictures which occupy the right side of the book. I feel this unique style of narration brings about a completely different perspective to the topic of buildings. It makes you see art and architecture in a different light and wonder, if all that you saw till today, wasn't all that was there to see. The stories cover a wide spectrum of themes from love stories to religion, from loneliness to old age, from adulting to existentialism - the author has witnessed it all at such close quarters that the rawness of it all, at certain passages simply overwhelms you. With dual narrative, the author presents a compelling picture of the two sides of the same coin. On one hand he highlights the beauty behind the architecture and on the other hand, he shows us the ugliness behind those walls, the emptiness in the lives of the people living within and the challenges faced by each one of them. Interweaving emotions with his acute observations, he manages to paint a poignant picture of life. Strongly recommend this book and experience this stellar attempt to bridge the gap between architecture and art. For students of art and/or architecture, this book would surely help you evolve better in the passion you have chosen to make your profession. For people who love travelling and enjoy observing the minute nuances of a structure, this one is a gem.